At Plastpol, which will take place from 26 until 29 May in Kielce/Poland, Demag Plastics Group SP. z.o.o will present a highly impressive exhibit: an El-Exis SP 200 for the production of IML decorated food containers will be on show as a system solution in hall G, stand 15. At Plastpol, Demag Plastics Group SP. z.o.o, a subsidiary of Sumitomo (SHI) DemagPlastics Machinery GmbH, Germany, will prove its expertise in packaging by exhibiting an El-Exis SP 200-920 with a clamping force of 2,000 kN, which will be producing and IML-decorating food containers. 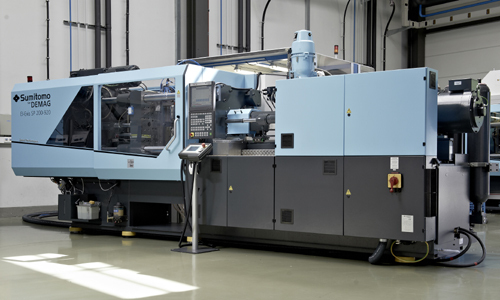 The injection moulding machine will be combined with handling equipment from Polymac Robotics b.v. to form a compact production unit, which allows the production of containers within less than 3.5 seconds. The polypropylene (PP)cups will be produced in a 4-cavity mould manufactured by Otto Hofstetter AG with a shot weight of about 6.2 grams. The El-Exis SP’s clamping unitwith its decentralized electric drive provides high-speed, careful mould opening and closing in order to achievea highly precise mould-stop position. This way, the labels are accurately placed and the cups are removed correctly. An NC5 plus control guarantees easy, uncluttered and intuitive machine operation. Numerous software features and adjustment options specially developed for packaging producers facilitate process optimisation. 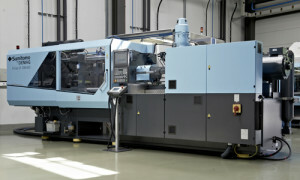 The El-Exis SP exhibited at Plastpol is also equipped with different Sumitomo (SHI) Demagactive features. In addition to the standard technology modules activeQ/Q+, activeCool&Cleanand activeAdjust, the machine runs with optional features such as activeMotionControl, activeScrewDrive, activePowerLinkand activeEcon. They improve the machine’s adaptation to the application at hand and help operators tap into the available efficiency potential. El-Exis SP injection moulding machines offer premium technological performance for the production of thin-wall packaging applications. Thanks to the combination of electric and hydraulic drives, El-Exis SP machines deliver maximum speeds and dynamics. These machines are the result of Sumitomo (SHI) Demag’s extensive market intelligence gathered over many years in the packaging segment. Thanks to a total of 20 years of market expertise and 15 years of experience with the El-Exis machine range, we have achieved very high process stability, which makes the El-Exis SP one of the best packaging machines in the world. When we developed the El-Exis range, the aspect of cost-efficiency was always at the top of our agenda. Parallel hybrid drives and virtually loss-free force transmission ensure that this machines combines maximum performance with low energy consumption.Aside from material costs, energy costs are the second most important parameter of cost-efficient production. Thanks to tried-and-tested, reliable machine technology, the El-Exis SP also offers high availability and a long service life.